See our NEW Radio Station page on the left side of this page! Now with TWO 24 hour Radio Stations! This is the ONE website that "_ _ _ _ _ _ _" Church of God ministers FEAR! This is the ONE website that "_ _ _ _ _ _ _" Church of God ministers DO NOT want you to see! Because it’s the ONE website that proves and documents where they have ALL, every single one of them, FAILED! Would Mr. Herbert W Armstrong fear this website? NO! He would AGREE with it! SEE and HEAR the proof, here and now on this website! Church Of God - Members of the Body of Christ holding fast to the Philadelphia standard or way of life (truth and doctrines) that JESUS CHRIST revealed and restored through His end-time apostle - Mr. Herbert W Armstrong. Greetings friends and brethren. 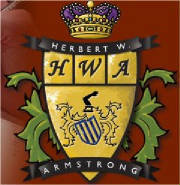 As this home page of our website loads, you will hear a short sound bite from Mr. Herbert W. Armstrong. PLEASE listen to this very short message before proceeding. This is God's Work NOW! Please click on the small audio player below to hear a VERY IMPORTANT soundbite from Mr. Herbert W. Armstrong (concerning Elijah). It only takes about a minute to play. One of the purposes of this website is to establish a point of contact for those who are interested in HOLDING FAST to the doctrines and truth restored here in the end time by Jesus Christ through His servant Mr. Herbert W. Armstrong. It is also for the purpose of bringing back into REMEMBRANCE those things which we were taught concerning specific subjects. Subjects that are forgotten or willfully and conveniently "overlooked" by so many today. We are a growing group (Church) of scattered brethren NOT associated with any other group or "offshoot" of the former Worldwide Church of God. We fully realize that we are in the prophesied end time Laodicean era of the Church. The Church of God today which SHOULD be an "organized" spiritual organism ALL speaking the SAME thing, is splintered, scattered and confused. 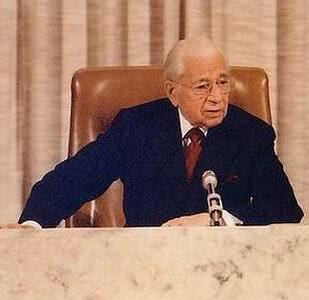 Each splinter group is teaching or preaching its own "version" of the gospel, and each group is teaching its own version of what it perceives as "the truth", INSTEAD of holding on to what Christ ALREADY revealed to His people in the end time through His chosen apostle - Mr. Herbert W. Armstrong. Please take the time to read through the articles posted on this site, and listen to the sermons on the "Sermons and Audio Archives" pages. They will show what has happened to God's ministry today, and what God Himself will soon do about it. These articles and audio messages will also paint a CLEAR PICTURE of what has happened to God's Church today (and WHY) and what exactly the "Work of God" is in these final days of man's rule. We are not seeking "new members" for the sake of adding to our membership. However we are seeking those of like mind for the purpose of fellowship and unity in the faith once delivered, and those who desire to return to the true Body of Christ. REMEMBER, God is a FAMILY! God's Church is a SPIRITUAL ORGANISM not just a physical organization. Scattered though we may be, we are still of ONE body, ONE mind and ONE spirit. Jesus Christ, the master builder, said that He would build His Church and that the gates of the grave would not prevail against it. This is absolute truth. His Church is still alive and well today! We were all given the keys long ago showing where that Church is and how to identify it. Do we remember? We also believe that Mr. Armstrong was used to FULFILL Matt. 24:14, and that it is now fulfilled prophecy (preaching the gospel to the world as a witness). He was the end time Zerubbabel and Ezekiel Watchman and the Philadelphia Messenger, as well as the last Apostle of the Church age. These are things that we all believed at one time as members of the WCG while Mr. Armstrong was still alive. But now, over 30 years after his death, many have forgotton or willfully departed from most or all of these teachings. So again, one of the primary purposes and goals of this website to help us all REMEMBER what we were taught, and to serve as a point of contact for those who are of "like mind". It is in THIS context, that the people of God are being warned to WAKE UP! Undoubtedly many will be offended by the message contained within this website. Indeed many already have been offended. But others who are AWAKE or waking up, "see it" right away, and respond in a positive way. Many were offended by Christ's message (the VERY Son of God!) and indeed many were offended by Mr. Armstrong's message, which was actually given by Christ THROUGH him. So it is no different today, over 30 years after the death of Mr. Armstrong. Many (even of God's own people) also WILL BE offended by the message or testimony of God's two witnesses when they come on the scene. Why is this, that they will be offended? Because it will not be the message that they "thought" it would be! And it probably will not come from two men whom they "thought" it should come from. 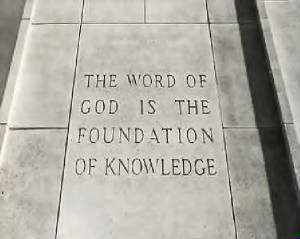 They will fail to recognize or remember that it is really GOD'S message, not a message from men. If you would like to understand more about this and other topics that God revealed to us through Mr. Armstrong, then PLEASE consider the information on this website. It is all written in a plain and simple style so that all should be able to understand. This website and the warning contained therein, is dedicated to the honor and glory of The Great God. Not to just any god. Not the god of this world and certainly not the god of protestant mainstream "Christianity". Nor to the many gods (ways and beliefs) of the many splits and divisions of God’s people (churches) today, nor to any other false god. This website is dedicated to the true God and Creator of all. 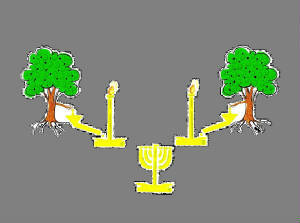 The God of Abraham and Isaac and Jacob. The God of ELIJAH of the Old Testament, who had such FAITH that when he prayed, God instantly answered! And to the God of the end-time Elijah whom Jesus Christ prophesied would come to restore all things and prepare "the way" for Christ’s second coming. And God DID fulfill this promise. It is to THIS God, the one and only true God, that we humbly dedicate this website and indeed our very lives. If after reading and listening to the information on this website, you desire to be a part of this warning work or to become a coworker with us, please see the "How To Support This Work" page at the left side of this page, or go to the "Local Congregations" page. What is this picture above? See the article entitled: THE TWO WITNESSES!